Thanks to some parent input and donations the older children have been exploring electricity. We were able to explore electricity through voice, art, movement and experimentation. Children were able to teach each other the knowledge they had about the topic. Some children were interested in creating artwork showing their knowledge of electric. We were able to explore static electricity through balloons and other found objects. Children were intrigued by how this type of electricity was formed and how it could be used to attract objects, including their hair! We also had a little hand eye coordination fun as we played “keep it up”, as the children called it, with the balloons! It is always lovely to allow for those spontaneous moments of growth! We began exploring current electricity as well. 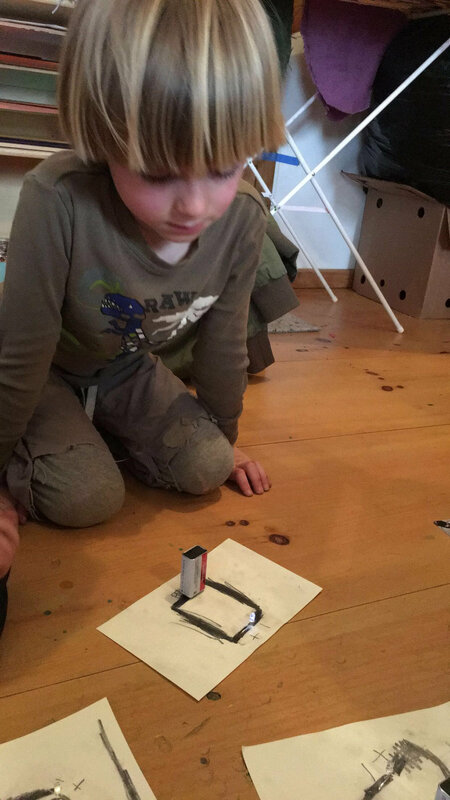 Using graphite, tape, LED lights, and 9V batteries we were able to create our own circuits. What a wonderful use of persistence, patience, teamwork, and problem solving skills! I plan to continue our study of electricity this week where we will create playdough circuits and potato circuits! What have you heard your child say they are interested in learning about? Share in the comments below!